Single point dresser natural or synthetic Diamond dressers. Consists of a natural diamond with one or more tips mounted in some sort of holder. Multi point dresser works with several diamonds in cut at the same time for better tool life or faster tightening. Synthetic Diamond in the form of square rods are used in both single-and multistone performance. These allow higher tolerances and smoother dressing results obtained. 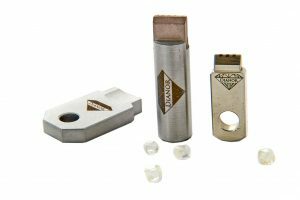 Diamond impregnated tool consists of a diamond powder bound in a sintered metal. 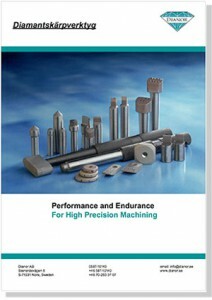 Provides robust tools for tough applications. FE/GC Only one good tip. Natural diamonds are classified according to number of good tips and the amount of cracks and inclusions in the diamond. A perfect diamond is in the shape of an octahedron of six good tips and is free from cracks and inclusions. A high quality implies good heat-discharge capability which is essential for the life of the diamond. FC: Normal quality, at least four good tips. Limited inclusions. FA/OA: Diamonds of the highest quality. Oktaedrar with at least five good tips and virtually free from cracks and inclusions. LS: “Long Stones”. Diamonds of exceptional quality, shaped like elongated “grains of rice” with very constant cross-sectional area through the whole diamond. Mono-crystalline diamond: “Monodress”. A rod with a square cross-section formed by a homogeneous synthetically produced diamantkristall. Like a natural diamond in a crystal lattice with certain special directions as to why it is important how the rod is twisted by the application against the grinding wheel. 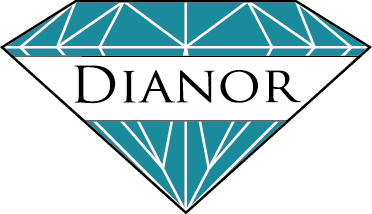 CVD-diamond, “Polydress”: As “Monodress” but Diamond’s structure is irregular. 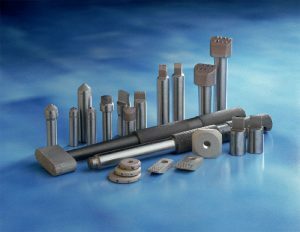 Dressing tools from the BVM series and BVP is used for profiling and sharpening of grinding wheels where high demands on precision and constant properties are set. By synthetic, in the form of a rod, has exactly the same width and area throughout his lifetime, the grinding wheel structure is held constant and a high profile accuracy can be achieved. In addition to this, there is a series of special design adapted to special applications. Contact us for recommendations. Here you can download a product sheet with standard range (Swedish). Diamonds are sensitive to nature, shocks and overheating. The grinding wheel should be well balanced and free of vibrations and the tool well fastened. Tearing should occur in the same proportion as the slipoperationen. 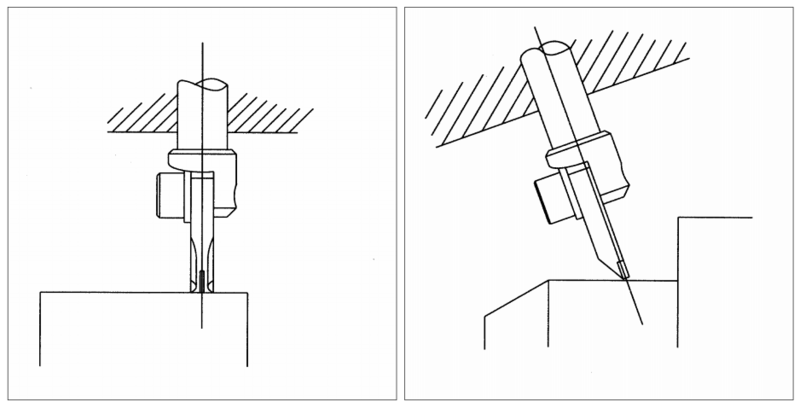 By tearing with coolant should the disc be flushed and be completely wet before the tearing, and the coolant is flowing continuously at tool engagement point. High flushing pressure is an advantage. When dry may not be tearing tool in surgery for more than a very short time. Let the tool cool down before the new procedures. Cooling not by adding coolant. Cutting depth normally 0.004-0.03 mm, max 0.05 mm.